It's no surprise that I love to bake. I would be lying if I said I haven't whipped together a batch of my delicious chocolate chip cookies late at night following a nice meal. Cake is a personal love of mine; there's nothing quite like pushing your fork through a soft, springy piece of rich, luscious cake. I especially love those slices that whisper moist little secrets in your ear. 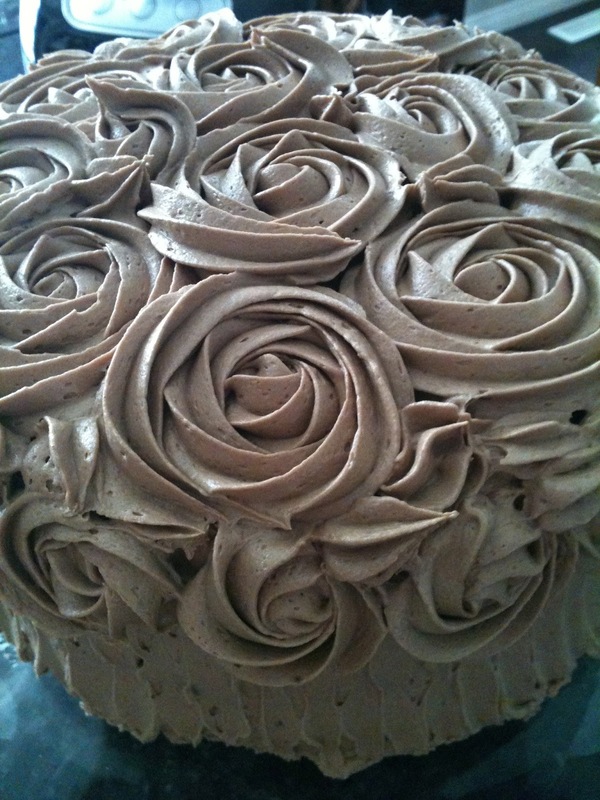 Which is why I fell absolutely in love with this Devil's Food Chocolate Cake I made for Tim's aunt. I have, for several family occasions, made cupcakes. Cupcakes are easy to serve, easy to eat, easy to bake. They do, however, lack a certain 'je ne sais quoi' when it comes to awesomeness. A double layer cake on the other hand is nearly the perfect dessert. It's right up there with lemon tarts or molten chocolate cakes... but those are separate blog posts. I digress. Also, I should confess that I didn't create this cake recipe. Oh heavens no. I am, after all, just your average momma making a yummy home, not a recipe maven. I picked it up at a Williams Sonoma Technique Class (which are, by the way, free if you're ever looking for something fun to do for an hour on a Sunday morning!). It's easy and so, so, so very delicious. *I rarely use actual buttermilk, instead I use: 1 1/4 cups whole milk mixed with 1 tablespoon of vinegar and let rest for 5 minutes. To make the cake, preheat oven to 350°F. The recipe recommends to lightly butter two 9-inch round cake pans and dust with flour, but I used a parchment circle on the bottom of my non-stick Baker's Secret pans and had great results... so I guess, do what you're comfortable with. In a small heatproof bowl or measuring cup, whisk together the boiling water and cocoa powder until smooth. Let cool completely. In your fabulous mixer, beat together the sugar and butter until the mixture is light in color and texture, about 3 minutes. Beat in the eggs, one at a time, then beat in the vanilla and the cooled cocoa mixture. When I made cakes in the past, I never followed these instructions. I always just creamed the butter and threw everything in at once. Don't do this. Take the extra couple of minutes and allow the butter and sugar to come together into a creamy cloud of awesome and then incorporate the eggs, one at a time. It really does make a difference. Trust me. Then, reduce the speed to low and add the flour mixture, alternating with the buttermilk (beginning and ending with the flour mixture). Beat until smooth, stopping to scrape the sides occasionally. Divide the batter evenly into pans and bake for approximately 35-40 minutes or until they bounce back to the touch. Transfer to wire racks to cool for 15 minutes. Run a knife around the sides of each pans to release the cakes. Invert the pans onto the racks and let cool completely. Variation: if you're set on cupcakes, the recipe makes 24. Bake for 20-25 minutes. Have all the ingredients at room temperature. Put the chocolate in the top pan of a double boiler, or if you're like me: an Anchor Hocking glass bowl over a pot of simmering water (easy peasy!). Ensure the bowl isn't touching the hot water. Stir until the chocolate is melted and smooth. Let cool to room temperature. In the bowl of your fabulous mixer (again) fitted with the flat beater, cream the butter with the vanilla and salt. Slowly combine the confectioners' sugar and the milk. I find repeating the cycle of adding one cup icing sugar and 1 tablespoon of milk achieves the best results. Plus, you're less likely to be covered in icing sugar and have one hell of a mess to clean up later. Beat on low speed until combined. Stop the mixer and scrape down the sides of the bowl. Increase the speed to medium and beat for 2 minutes, then reduce to low and slowly add the chocolate until combined. Increase speed again to medium and beat for 1 minute more. I find the measurements of this recipe spot on, but if the frosting is dry, add more milk, 1 teaspoon at a time, until it is creamy but still holds peaks. Makes about 4 1/2 cups of buttercream. I had blackberries in the fridge that I didn't want to go to waster so I quickly 'macerated' the berries with a scant spoonful of icing sugar and stirred them up. This will make them juicy and soft. I added a layer of berries before placing the second layer on top. Place the second layer, top side down, on top of the first layer. 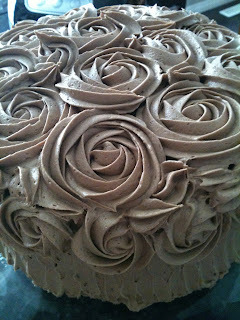 Frost the top and sides with the remaining buttercream. Note the parchment sleeves... tuck these under the edge of your cake so you can gently tug them out after frosting and you'll have a clean plate or cake stand. Place the second layer, top side down, on top of the first layer. 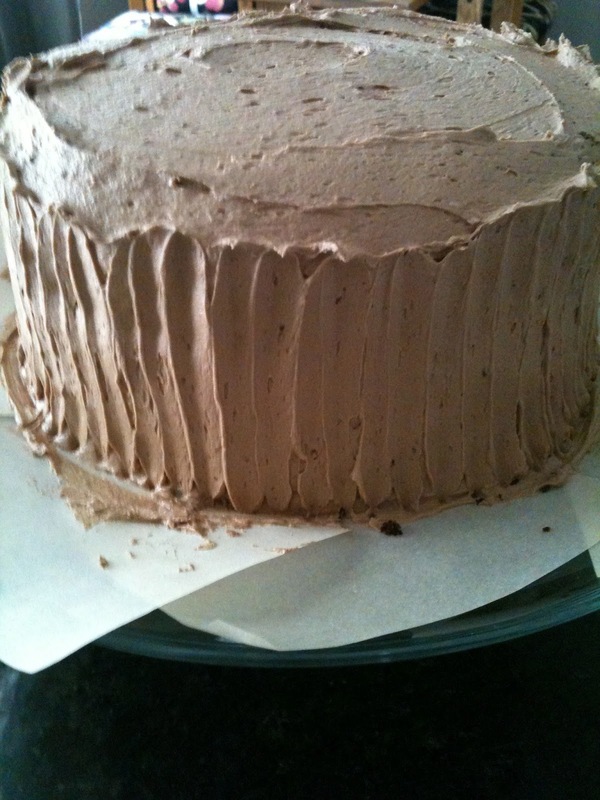 Frost the top and sides with the remaining buttercream. 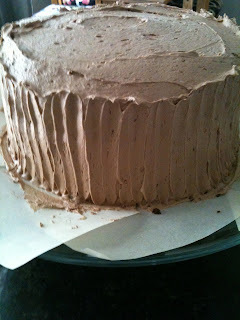 To clean up the sides, I 'pulled' the buttercream up, bottom to top, all the way around. I took a page from the iambaker tutorials (http://iambaker.net/rose-cake-tutorial) and finished the top with the roses, as seen below. And before you start to think that you can't do this, you totally can. It's as easy as fitting your piping bag with a run-of-the-mill star tip, then slowly move your tip in a circle around the centre point. Try to end in the same place each time. Since the flowers big, you're bound to have some 'dead' space. Just go in and make a swoop with your tip in the same direction as the rose right next to it. You can hardly tell where the fill ins are. Place in the fridge for at least 30 minutes to allow the buttercream to firm up. Now, all you need to do is show up at that dinner party or birthday bash or baby shower or fill-in-the-blank and you'll be the talk of the town. Truly, it's that easy. Would I lead you astray? When it comes to cake... NEVER!